'Joyful parenting' seems like an oxymoron many days. In the trenches of parenting, no matter the season, there are moments of deep struggle. There are moments you hide in your closet with the last of the Halloween candy wondering why God even gifted you with these children. Are you even capable? How did He think you were equipped for this job? Truth time, friend. You are a good mom. In fact, you are a great mom. And He has chosen you for this holy work, knowing full-well you are capable in Him. Mama friends, He knows this is not an easy job and as such He gently leads those that are with young. He sees us. He knows us. And He wants joy for us in this holy job of parenting. Let's look to Him this week when we find ourselves deep in the realities of parenting. Let's allow His grace to be our portion as He guides us. A sweet friend shared these prayers from Ann Voskamp with me last week and I just knew they needed to be passed on to you. 1. Just for today, I will ask for His grace to make our home a house of prayer. I will pray at set times. And I will invite our children to come move into an interior space that lives with God. 2. Just for today, I will ask for His grace to transfigure all things into beauty. He's working to redeem all things, in His time, into the image of His Son. 3. Just for today, I will ask for His grace to see that life is not an emergency. Emergencies are sudden, unexpected events— and is anything under the sun unexpected to God? I can slow and I can trust. 4. Just for today, I will ask for His grace, that when stress mounts, I'll dismount it with gratitude. My stress coping mechanism will be verbal intervention with verbal thanks. It's impossible to simultaneously feel stress and gratitude at the same time and I choose to give thanks at all times. Fight feeling with feeling! 5. Just for today, I will ask for His grace to speak words that are only strong words, words that make these children feel strong. Grace words. Grace is the only non-toxic air. 6. Just for today, I will ask for His grace to be consistently consistent. I will create safe rhythms that our children can find security in. I will create daily ceremonies because everyday we are CELEBRATING the gift of now! 7. Just for today, I will ask for His grace, the moment when I am most repelled by a child’s behavior, that is my sign to draw the very closest to that child. 8. Just for today, I will ask for His grace to hug each of my children as many times as I serve them meals — because children’s hearts feed on touch. I’ll look for as many opportunities to touch my children today as possible — the taller they are, the more so. 9. Just for today, I will ask for His grace to make my priorities all Things Unseen. 10. Just for today, I will ask for His grace to laugh! And I will let the little children laugh! I will create a culture of JOY! Find her full post here. November is an interesting time of year. We're somewhere on the corner of respecting "the Turkey" and dancing around decking the halls. I'm a Christmas lover. It's always been go big or go home around here at Christmas, but there's something about the thanks part of Thanksgiving that's really gotten ahold of me the last few years. If we were sitting down for coffee today, I'd probably pour out a whole lot of wild tales about my pre-schooler's awful behavior lately but despite the hurdles we're facing I'm overflowing with gratitude. It's tough to cultivate balance in any season. To have the hustle of life bustling around you while also being still in front of the Lord with an open heart. Friends, we are imperfect, empty vessels fit to be filled with a perfect God. To have a consistent dialogue with God, I'm talking prayer, with God gives us that opportunity to be filled with Him. It allows us to tap into the fruits of the Spirit He's already equipped us with. When we still ourselves in these seasons of busyness and focus in on Christ, we're steadying ourselves in a place to live out this Truth. 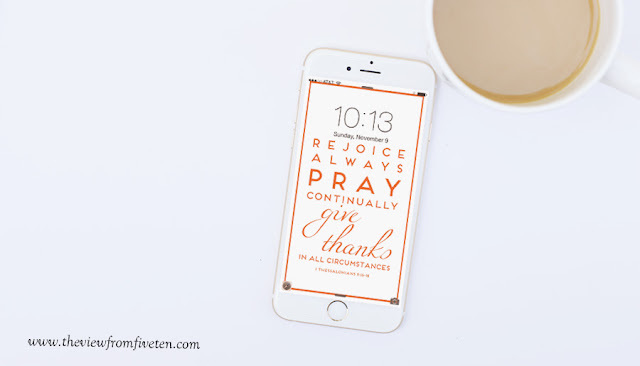 Joy, consistent prayer and thanks will flow from us when we're intentional about our time in prayer. Join me this week as we meditate on this piece of scripture. Let's be convicted to rejoice always, pray without ceasing and to give thanks in all circumstances. Let's not just glance over this Truth, let's lay it on our heart by memory as we walk into our daily routines this week. The saying, comparison is the thief of joy, rings so true these days. As I look around to the other women, creatives, mothers, boss ladies, etc., it’s far too easy to fall into the trap of comparison. I’ve been immersed in social media since journalism school. This was well before it had even been coined "social media." Blogging was just getting feet, Twitter had all of 300 members comprising of major news outlets & journalism students, and Pinterest was a distant discovery. In the seven years since journalism school, I’ve made a conscious decision to remain part of the social media world. But better yet, I’ve decided to make my online life mean something. That is, if I’m going to be here in this generation of social media then I’m going to utilize it to feed my spirit not drain it. Let’s put comparison on the sidelines and start filling up on goodness as we scroll through our social media feeds. In the last year, I’ve weeded through every last social media outlet to intentionally follow people who scatter encouragement & joy and unfollow those who don’t. Here are six resources to help you cultivate intentional, joy-filled social media feeds. If we're filling our white space with social media, let's be intentional about it. Friends, if you aren't familiar with this community I'd make some time to do that after reading this post. They host an annual conference (I'd love to attend), run a blog, online community groups and are an overall awesome ministry. I'm pointing you specifically to their new Podcast series though. Y'all, it was love at first episode. There are now TEN different podcast episodes each one filling for your spirit. This group of women are such an encouragement in motherhood. Their Instagram feed is one of my favorite, but I think their greatest little gem is their newsletter. Motherhood is no easy season, and while it's a blessing it really does take a village! This site is relatively new to me, but it's hard not to be drawn to this community. With an active blog drenched in the Good News and a book club currently reading through Annie F. Downs' Let's All Be Brave, there's a lot to get into. Jess Connolly has such a beautiful heart for encouraging women in their walk with Christ. Her Thursday newsletters are something I look forward to, and each and every week I savor every last word of that email. This ministry has a special place in my heart and daily life. A group of women who originally came together through a hashtag on social media has grown into so much more. At the heart of it though, She Reads Truth is simply a place for women to be in the Word together daily. It's changed my life and relationship with the Bible. Their website offers free daily readings and this year they've launched an app for iPhone and Android users! A space specifically created for the faithful entrepreneur. YAY! Their blog and shop focus on living life well, not perfectly (but well) with a whole lot of grace. I could go on about the necessity of community in growing a company, but if you're doing that then you probably already know it's vital. 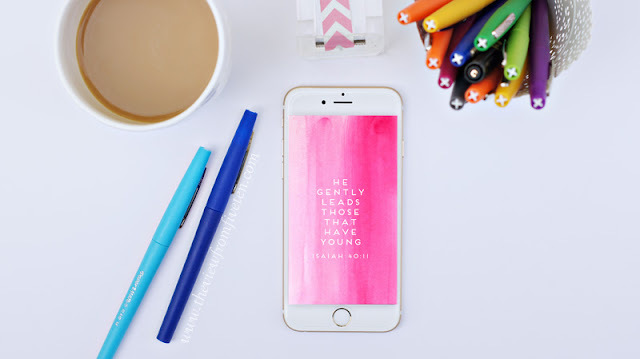 What are your go-to outlets for encouragement online?